TWICE has released the track list for their sixth mini album ‘YES or YES‘. It will be released on November 5th at 6pm KST. So far, they have already released concept photos and a group teaser image. 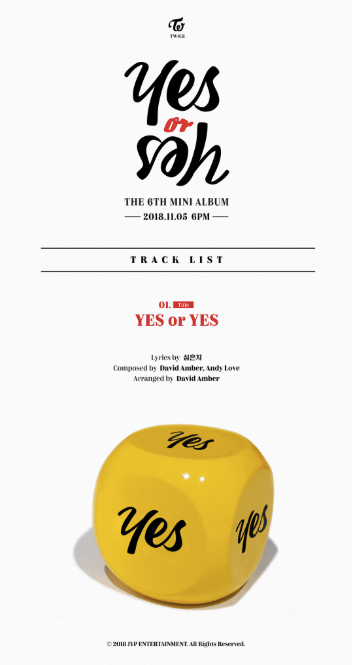 The title track will also be called ‘YES or YES‘. The track contains five tracks. For some reason, the second track on the mini album has not been revealed. In the first image, there is an image of a yellow die with curved edges that says “yes” on all the faces. A smaller version of a black die appears in the second teaser. This further suggests that their comeback will be related a game concept. What do you think of their track list? Let us know in the comments below.